It's funny how the actual travel to a place always seems to take much longer than the return back home. We arrived in St Barts to glorious weather which lasted the entire time. When we arrived we checked in with the WSBH Wimco office, picked up our Terios and checked into the newly renovated Hotel Taiwana on Flamands Beach for 2 nights. The first thing you notice when you arrive at the Taiwana is the blend of modern elements (such as red wicker broom back chairs) and traditional - the signature Indian chief with war bonnet and black accents throughout the hotel. 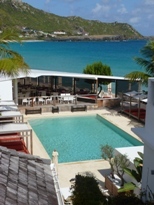 The bar and restaurant are crisp and modern and inviting and overlook beautiful Flamands beach. The hotel has incorporated mossy walls of orchids, so immediately you notice the most beautiful sprays of flowers and colors. There are 22 rooms and suites and my room was #10, up one flight of steps from ground level. It was lovely, with a 4 poster King bed, white linens, large bathroom in blue and green Mexican terracotta tiles, shower and large walk in closet with bathrobes. The hotel features L'Occitane amenities - love their shea butter and verbena shower gel. We had dinner the first night at PaCri which is now housed at Taiwana for dinners only - it is a perfect fit. I think of all the meals we had, this one stands out the most in my mind. My risotto was delicious but the "La Burrata" which is like a really soft and wet fresh mozzarella, oh oh oh.